On a daily basis, 15 to 20 trailers are loaded with railing, grids, and other outdoor security products at Heras in Oirschot. Due to the fact that fork lifts, side loaders and four way forklifts are nowadays equipped with cameras, operations are safer, more efficient and the number of damages has decreased. “We have been using cameras since 2012”, logistics coordinator Fons Heeffer says. “We then purchased the first Linde lift trucks with attachments. Very pleasant to work with, but the forks are positioned in a way that blocks the operator’s view. When the forkcarriage is on eye level, you’re basically working blind. Lifting a pallet with reach forks that are 5,5 centimeters thick without damaging the truck’s load or wiring is difficult”. That is why the lift trucks were equipped with two cameras. One camera is positioned between the forks and therefore moves along with the forks. The other camera provides view on the load from above. “That makes the job more comfortable. Operators no longer have to bend their bodies out of the cabin in order to see the forks”, Heeffer says. 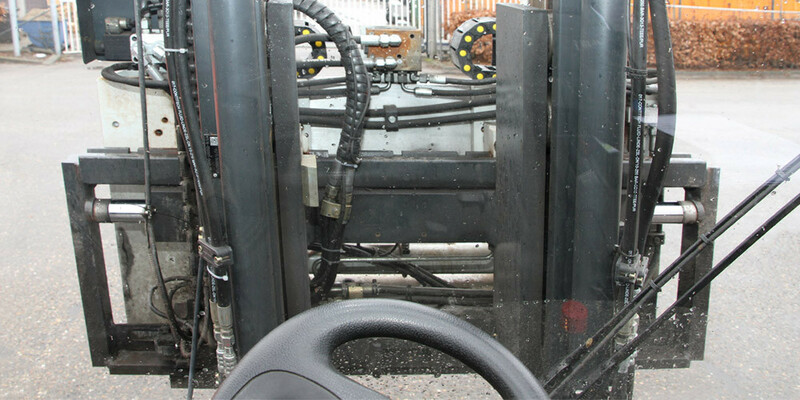 The two side loaders as well as the 11,000 pounds four way forklifts are equipped with a camera and monitor system in order to have a better view on the load and the surroundings. The latter is done via front and rearview cameras. The monitor automatically switches to the correct camera when the truck is driving forwards or backwards. “If a person is behind the truck, the camera shows it immediately. The operators can also maneuver more easily and turn along the stands, because surroundings are always perfectly displayed on the monitor”, Heeffer explains. He cannot provide any figures, but Heras’s logistical coordinator is convinced that cameras contribute to avoiding accidents, damages and consequential damages. “99 out of 100 times everything goes fine, but you want to avoid that 100th time at all costs. In hindsight I think: why did we ever work without cameras? It’s pretty dangerous.” Furthermore, the improved vision enables the operators to work faster. “We no longer have to stop all the time in order to check whether we’re about to collide with anything. That saves time. We can do more in one day now”, Heeffer says. And that is not an unnecessary luxury. Heras is doing well. The outdoor security specialist provides a growing number of both national and international customers with railing, access gates, detection systems and security cameras. The customers are mostly served from Oirschot, where Heras owns an outdoor storage of over 50,000 m2 and a warehouse with an average of 30,000 products in stock.